Headquartered in Roanoke, Va., Advance Auto Parts, Inc. (AAP) is a leading automotive aftermarket retailer of parts, accessories, batteries, and maintenance items. Advance Auto Parts (AAP) serves both the do-it-yourself and professional installer markets. The company operates over 3,900 stores in 39 states, Puerto Rico, and the Virgin Islands. AAP’s successful email marketing program allows customers to sign-up to receive product information and great deals. Wanting to capitalize on mobile, AAP turned to CodeBroker to expand their reach. AAP customers can now sign-up for offers using their mobile device by texting AAPDEAL to AAP’s shortcode. After texting in, customers receive an SMS message with a CodeBroker SmartLink™. Customers click on the SmartLink and are brought to an easy-to-use web form. AAP customers enter basic information about themselves on the web form. The mobile phone number is pre-populated ensuring no mistakes are made entering the mobile device number. Following sign-up, the customer receives a one-time-use mobile coupon via SMS for joining AAP’s email marketing program. To redeem the coupon, the customer presents the coupon on their mobile phone to an AAP sales associate at the time of purchase. As a one-time-use coupon; once the mobile coupon is redeemed, it is no longer valid for future purchases. CodeBroker’s unique security model ensures Advance Auto Parts customers receive only one mobile coupon – the same coupon regardless the number of times the customer attempts to sign-up for AAP’s email marketing program. 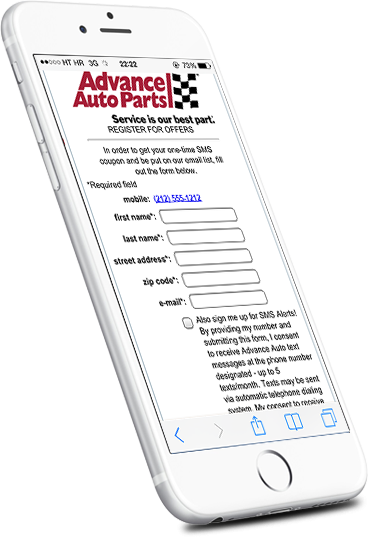 Using the CodeBroker secure mobile coupon platform, Advance Auto Parts continues to grow its email marketing program through a rich customer experience.